Hundreds of homeowners throughout Maryland were left with damaged roofs and siding after the March 2nd storm. If you are like most homeowners, you have never filed an insurance claim for storm damage. Luckily, we specialize exclusively in insurance related claims like fires, floods and storms, so we can help guide you through the process. How do I know I have wind damage? The most obvious signs of wind damage are missing shingles and pieces of siding. However, wind damage isn’t always noticeable from the ground. Shingles can curl or become loose, which you may only see from atop the roof. We also take into consideration the wind rating of your shingle. A lifetime architectural shingle has a much higher wind rating than a 3-tab shingle. If you have a 3-tab shingle, the wind rating is only around 60 mph, well below the wind gusts we experienced on march 2nd. It’s very probable you have wind damage. Who do I call first? In a situation with a severe storm, insurance companies will become backlogged quickly. We recommend calling your agent or insurance company and placing a claim immediately after a storm to avoid long wait times. Your second step is to call a qualified insurance contractor to evaluate your damage. 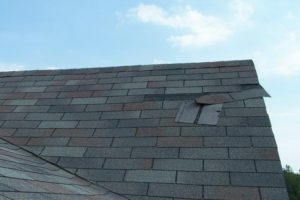 You may find that your roof only warrants a small repair or it may warrant an entire replacement. This professional can help you decide if you should continue pursuing your claim or not. How do you pick a contractor? Not all contractors are created equally. First, ensure this contractors specializes in insurance related claims and isn’t just taking them on because of the recent opportunity for business. Secondly, do your research on their company. Do they have online reviews? A formal website? What certifications do they carry? How long have they been in business? What does their warranty look like? The last piece of advice we give all of our customers is how do you feel about them? Ultimately, you will be working with this company to restore your home and you want to feel comfortable. Go with the company that you felt the most comfortable talking with and who was most helpful, not the one who pressured you most to sign with them or made you elaborate promises. How long will repairs take from start to finish? This is a tough question to answer because it is very case-by-case dependent. Some insurance companies are easier than others to work with. Some roofs have more obvious damage. Weather can certainly be a factor, such as rain or colder temperatures. The typical timeline is once you file a claim, within 2 weeks an adjuster should come out to asses damage. Within 1 week of that (hopefully), your insurance adjuster will generate an estimate for repair. Your contractor should carefully review this estimate to ensure everything is properly covered like ice and water shield, code upgrades, all slopes of the roof, etc. Once the estimate is agreed upon by all parties, you pick selections for your new roof if applicable. We tell homeowners about two weeks after their estimate is approved, they can expect to be scheduled for repairs. If you have more specific questions or want to learn more, feel free to contact us or give us a call! We are always happy to help. Is Your Insurance Estimate Up to Code?